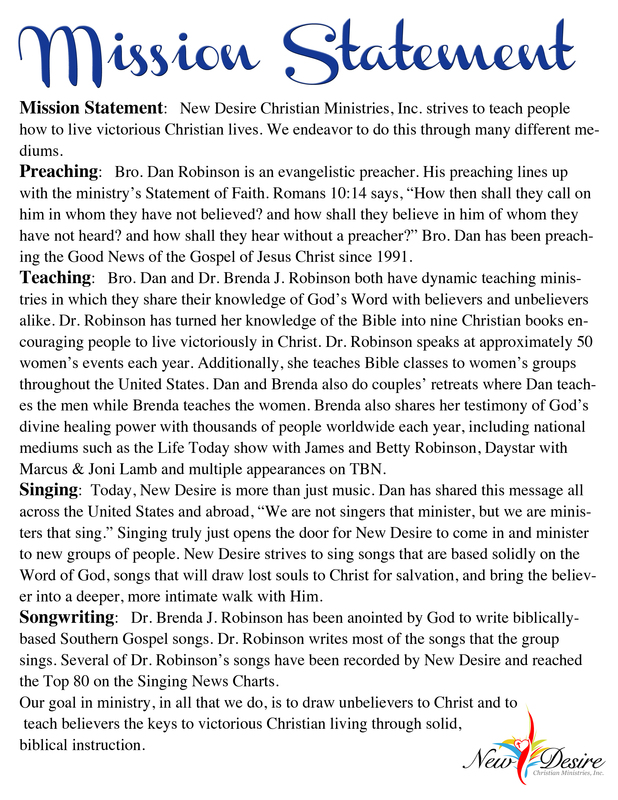 Dan and Brenda Robinson - Founders of New Desire Christian Ministries. Click here to see our new apparel! Book New Desire Today ! Are you interested in booking New Desire for your next service or event? 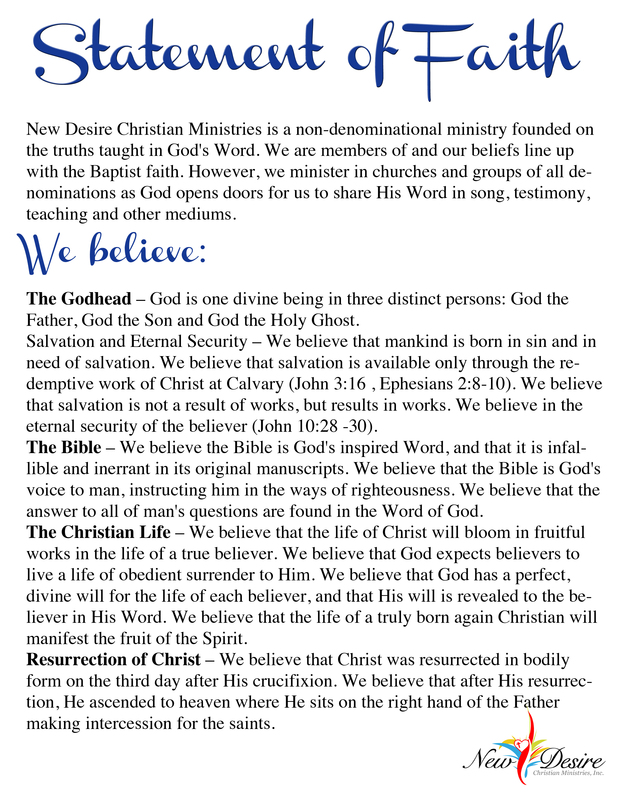 New Desire is a very multi-faceted organization with experience in all areas of ministry. They are available for concerts, church services, revivals, Homecomings, women’s conferences and retreats and marriage enrichment retreats. Bro. 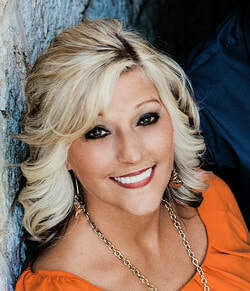 Dan Robinson is an evangelist who has preached all over the United States and in several different countries. He loves to fill the pulpit any time he is given the opportunity. Dr. Brenda J. Robinson finds her joy in teaching women and young girls the importance of knowing and living the Word of God. With over 25 years of experience in teaching Biblical principles, she would be a great asset to your next women’s or girls event. Together, The Robinson’s have been providing solid biblical teaching and counseling for couples and families in need of refreshment and renewal. Their testimony of tragedy and triumph will be the inspiration many couples need to keep pressing forward in the hard times to come. No matter what event you are booking, New Desire will provide the music. So how do you book New Desire? Simple. Fill in the form below or call our office at 770-684-8987, Monday-Thursday between the hours of 9:00 and 5:00 PM EST. One of our office staff will go over our calendar of events with you and find a date that will best suit your individual needs. Regarding finances, New Desire will fulfill your event on a love-offering basis. As we enter your worship service by faith, we ask you to fervently pray for God to bless the offerings so that we can continue to serve on an honorarium basis. If the church has a specific amount set aside for our event, we recommend that you also take up a love offering for those who may be visiting and would like to give to help further our ministry. Our heart is to share the Gospel with as many people as possible. If the scheduled date is a ticketed event, please understand that we do have a set fee for this type of event. For more information on ticketed events, please contact our ministry office. If for any reason you must cancel a scheduled event, please contact us at least 30 days in advance so that we can fill that date. 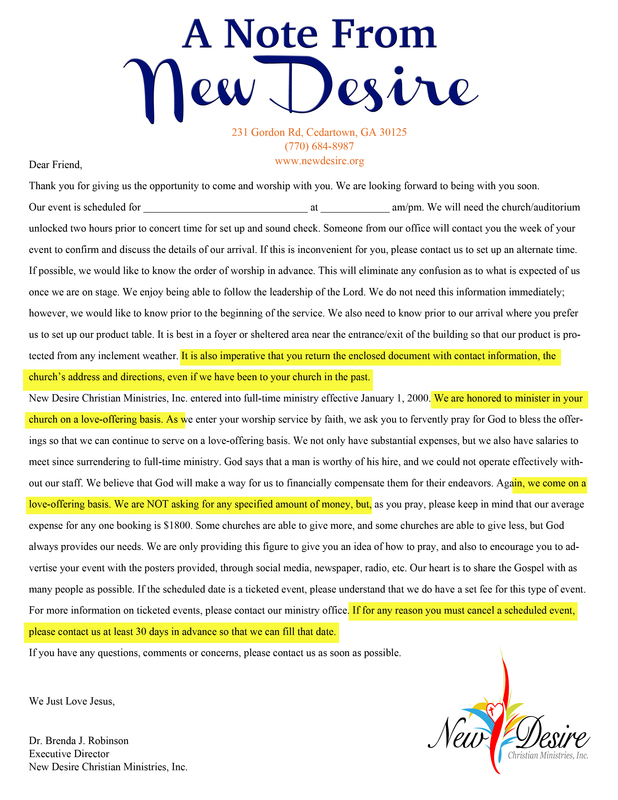 We pray that you will consider having New Desire for your next event. We look forward to serving you and worshiping alongside you. We Just Love Jesus!